Self-care begins when you are healthy! Kristen Reed Edens, Kristen is a content developer and blogger covering issues important to those 50+: business, money, retirement, health, family, and midlife balance. Yep. 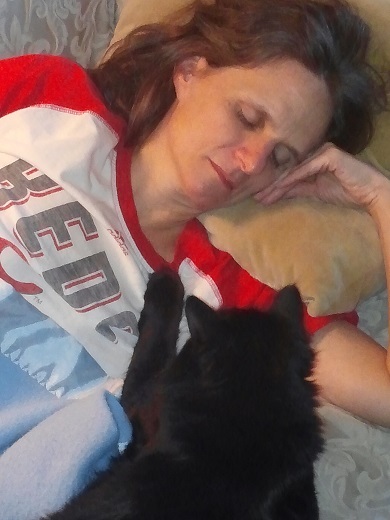 That’s me on November 20, 2016, snuggled by my kitty who rarely left my side during the affliction. Sometime during our Saturday woodfest (clearing out the fallen trees and brush from our property), I started to feel a little off. I brushed off the ill-feeling as imaginary or possibly driving myself a little too hard but still hydrated myself and limited food intake on the precautionary side. Earlier this year, I wrote, Entrepreneurs NEVER Get Sick! The message at that time was how to take care of yourself and business when you do get sick. The message today is to take time for self-care to limit sick days. Yes, there will be days we’ll get sick, but the more you take care of yourself now, the shorter the duration and severity your sick days will be in the long run. You’ll have the physical, mental, and emotional well-being to make it through the highs and lows of running a business. You’ll have more energy to keep up with the demands of business ownership. Stretch, stretch, stretch! Ideal for mental focus and clarity. This is the most overlooked, and easiest form of exercise and very few people stretch other than that first morning stretch as we get out of bed. Take 10 to 15 minutes a day to stretch your major muscle groups. Combine your stretching with meditation and get a 2-for-1 bonus. Remember to stretch your shoulders, neck and back as well; most of us spend a lot of time at our computers—this will help minimize strain in those areas. Who cares if you can’t touch your toes—you’re still getting the same stretch as those that can. A daily exercise break offers an opportunity to step away from the office and clear the mind. You’ll find ideas and solutions pop into your head faster than stewing over a computer screen. While a blog or e-newsletter takes a while to gain traction with your readers, your body and mind will benefit from exercise every day. A daily exercise routine is the perfect way to keep from going viral! Kristen Reed Edens is a content developer, blogger, entrepreneur, grandparent and caregiver. In 2015, she founded the blog and community, Grandparents in Business, where she shares stories and solutions for those living in the Sandwich Generation. Follow her on LinkedIn, Twitter, and Facebook. Why Being Sick was the Best Thing that Happened to Me!